1 comScore. The 2015 U.S. Mobile App Report. Danova, Tom. 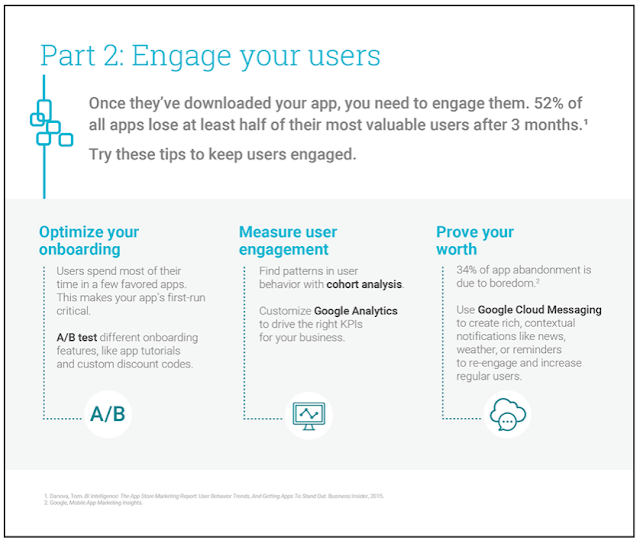 BI Intelligence: The App Store Marketing Report: User Behavior Trends, And Getting Apps To Stand Out. Business Insider, 2015. Users read, watch, listen, and connect with content across multiple screens throughout the day. With every interaction, they expect fast, safe, and relevant experiences regardless of where they are or what device they’re using. In this environment, publishers only have a split second to deliver the most relevant and highest paying ads to maximize their overall yield without increasing latency and potentially losing users. A few weeks ago at the IAB Ad Operations Summit, I spoke about a new feature we are testing to deliver yield, speed, and control, called DoubleClick for Publishers First Look. Today, I’d like to give you some more details about it. One of the fastest-growing segments of programmatic advertising has been from high-CPM, low-match-rate buyers, such as remarketers. These buyers are willing to pay a substantial premium to publishers in exchange for a ‘first look’ at all of a publisher’s inventory, but they need to see a lot of impressions to find the ones they value. The standard implementation of this first look has been through a header bidding tag to indicate interest. While this works, unfortunately it has drawbacks. It adds latency to every pageview, gives one buyer preferential access, and gives up the control and protection of an ad exchange. A better solution would reduce or eliminate latency, enable any selected buyer to compete, and allow publishers to manage demand just as they do with other private or open marketplaces. First Look does just that. It allows publishers to give trusted programmatic buyers the opportunity to bid on 100% of their inventory -- even ahead of sponsorships and reservations. By allowing these buyers to see more inventory, and by putting them in real-time competition with each other, publishers in our Beta test have seen an average 10% lift in revenue. First Look is simple to set up (no added line items), creates zero added latency (no additional ad requests), and works across all channels and formats. 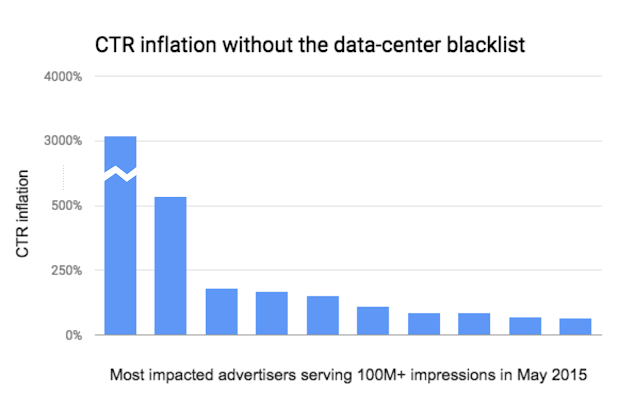 And since First Look is part of the DoubleClick Ad Exchange, you don’t lose any of the controls and protections you already rely on like creative review, category blocking, or malware protection. “First Look has shown strong performance, increasing our revenue by a double digit percentage across all of our properties. There were no added tags and no need to change our page setup. Best of all, there has been no impact to what our users experience when they visit our properties, regardless of the device they’re using." Jeremy Hlavacek, Vice President, Programmatic, The Weather Company. “First Look is an exciting step towards having all demand compete, simultaneously. Access to more users who are typically consumed by guarantees will drive higher ROI, and the high prices of the inventory should dispel any myth that programmatic is not premium." As I mentioned at the IAB Ad Ops Summit, DoubleClick’s mission is to help our publisher partners grow their ad revenues in a healthy long-term market. With First Look we are striving to create a solution that delivers lift for publishers without sacrificing consumer experience or publisher controls. We’re excited to launch DoubleClick for Publishers First Look to all publishers early in 2016. Space in our beta is limited, but if you’re interested in getting set-up before the holiday rush, contact your account manager today. And in the coming weeks, stay tuned for more tips on how to maximize your overall yield. Mobile is changing the way people experience content - including advertising. Every time they reach for their devices, they expect to find what they are looking for and be engaged, and they quickly look elsewhere if their experience is poor. In this environment, publishers must take new approaches to advertising to grow revenue. More than ever before, advertising experiences need to be relevant and respectful of the user’s context in the moment. At DoubleClick, we’ve been investing heavily to help publishers address this challenge. With DoubleClick Ad Exchange, we’ve built programmatic technologies that scale advertising to wherever users are, in the moments that they’re most likely to respond. We’ve also developed mobile-first, immersive ad formats to keep users engaged and ensure advertiser goals are met. Today we’re excited to bring these two areas of investment together for our DoubleClick customers with programmatic support for native and video formats on mobile. Earlier this year, we announced support for native formats in DoubleClick for Publishers. Now we’re also enabling publishers to sell native ads programmatically, both in the open auction and in private marketplaces, on DoubleClick Ad Exchange. This is available now in apps and will roll out for cross-screen native ads over the next few months. Beta testers of these features, including eBay, have already experienced strong results. 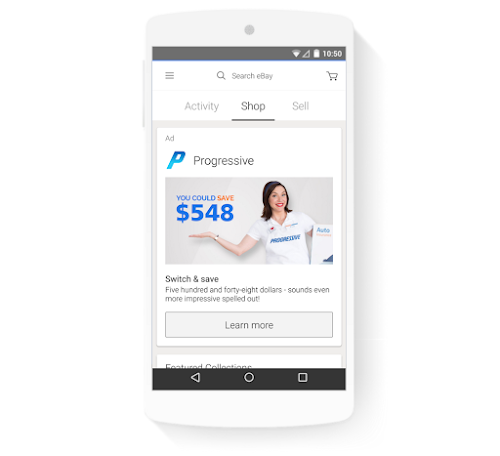 As a pioneer in the programmatic space, eBay recently rolled out its Native Mobile Programmatic solutions, which have revolutionized the way brands deliver their message to the right person, at the right time. Since the launch of its new native ad unit, eBay is seeing a 3.6x increase in ad engagement on average, with some campaigns delivering click-through rates up to 5%. Together, these innovations help address a strong demand from ad buyers for native and mobile video formats that can be bought programmatically. "We've been a longtime supporter of DoubleClick’s programmatic solutions for mobile,” says Adam Foroughi, CEO and Co-Founder of AppLovin Corporation. "The Native and Mobile App Video ads on AdX are in high demand among our buyers and have shown strong performance both for advertisers and publishers. We're happy launch partners with DoubleClick on these new initiatives." As the digital world around us continues to shift, these innovations are just some of the ways we’re helping publishers and advertisers adapt to changing consumer preferences and thrive. 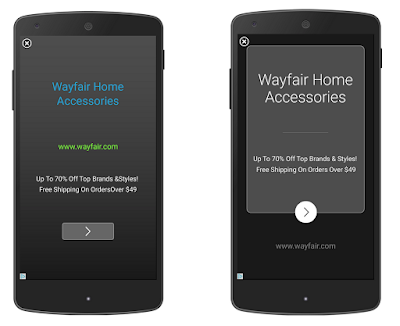 Source: eBay Ad Serving Reports, in-app home screen placements, FY 2015. *There are many factors that impact video demand on a publisher's app and experiences may vary. Earlier this year, research from Google showed that nearly half of all display and video ads were not viewable. This has helped move forward the ongoing industry discussions around shifting digital ad buys from served impressions to viewable impressions. Simultaneously, advertiser demand for 100% viewable impressions, where advertisers only pay publishers for impressions that are viewable based on the current industry standard as defined by the MRC, has continued to grow. To help publishers tackle this complex issue, we partnered with experts from The Washington Post and Forbes along with the DoubleClick for Publishers and Active View teams at Google to create an educational case study that surfaces key issues publishers should consider as they respond to RFPs for 100% viewable impressions. 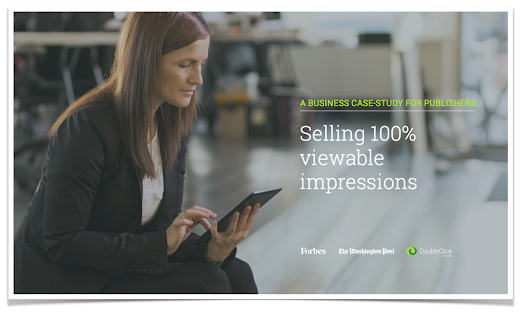 The illustrative scenario in the case study walks through how a sales director at the fictional publisher, The Hourly Report, responds to a RFP from the fictional advertiser, Eh-Okay, for a commitment to provide 100% viewable impressions. The case study references two fictional viewability measurement technologies, Ad Chemist and Bridge, along with Google’s Active View solution, to represent the fact that there’s more than one way for advertisers and publishers to measure viewability. "The potential for an ad to be seen is an extremely reasonable expectation for a marketer and their agency...especially from a premium publisher such as The Washington Post. As the concept is still relatively new, challenges exist with making it an absolute reality. It is key that we are on the forefront of helping to aggressively move the conversation and process forward, and partnering with Google and DoubleClick on efforts like this case study to help educate the industry is a key step in the right direction." We’re strong believers that the viewability discussion should be just a starting point for publishers and advertisers: understanding whether an ad had a chance to be seen is the first step on the path to ultimately being able to measure whether it had impact. Adopting a single industry standard for viewability - like the MRC defined standard that Google supports - is a critical first step along the path to transacting media exclusively based on viewable impressions. Over time we anticipate that other Google products such as Google News will also integrate AMP HTML pages. And today we’re announcing that nearly 30 publishers from around the world are taking part too. This is the start of an exciting collaboration with publishers and technology companies, who have all come together to make the mobile web work better for everyone. Twitter, Pinterest, WordPress.com, Chartbeat, Parse.ly and LinkedIn are among the first group of technology partners planning to integrate AMP HTML pages. Content: Publishers increasingly rely on rich content like image carousels, maps, social plug-ins, data visualizations, and videos to make their stories more interactive and stand out. They also need to implement ads and analytics in order to monetize the content and to understand what their readers like and dislike. The Accelerated Mobile Pages Project provides an open source approach, allowing publishers to focus on producing great content, while relying on the shared components for high performance and great user experience. The initial technical specification—developed with input and code from our partners in the publishing and technology sectors—is being released today on GitHub. Distribution: Publishers want people to enjoy the great journalism they create anywhere and everywhere, so stories or content produced in Spain can be served in an instant across the globe in, say, Chile. That means distribution across all kinds of devices and platforms is crucial. So, as part of this effort, we’ve designed a new approach to caching that allows the publisher to continue to host their content while allowing for efficient distribution through Google's high performance global cache. We intend to open our cache servers to be used by anyone free of charge. Advertising: Ads help fund free services and content on the web. With Accelerated Mobile Pages, we want to support a comprehensive range of ad formats, ad networks and technologies. Any sites using AMP HTML will retain their choice of ad networks, as well as any formats that don’t detract from the user experience. It’s also a core goal of the project to support subscriptions and paywalls. We’ll work with publishers and those in the industry to help define the parameters of an ad experience that still provides the speed we’re striving for with AMP. We hope the open nature of Accelerated Mobile Pages will protect the free flow of information by ensuring the mobile web works better and faster for everyone, everywhere. Today we’re excited to launch our new Certified Publishing Partner program. Certified Publishing Partners are trained experts on AdSense, DoubleClick for Publishers, and DoubleClick Ad Exchange who could help you earn more from your sites while also saving you time. Whether you’re just starting out with ads, fine-tuning your existing ad setup or looking for brand new revenue sources, Certified Publishing Partners are ready to help you achieve your goals. They know how to make online ads work harder for you so you can spend more time creating and publishing your great content. 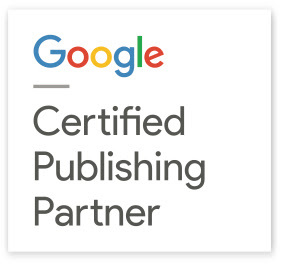 When you see the Certified Publishing Partner badge it means that a partner has been carefully vetted and meets Google's rigorous qualification standards. They have received high rankings in client satisfaction. They are, in short, a trusted business partner. The Certified Partner Program is officially open for business today. Learn more about the program and see a list of our partners. Then let us know what you think in the comments section below. Over the years, we’ve found that maximizing competition for every impression produces the best results for you. That’s why we’ve developed new Custom and Flexible Ad Size controls in DoubleClick Ad Exchange to bring you even more competition for every impression so you can sell any ad size programmatically. Region-specific ad sizes have always been difficult to monetize programmatically because they typically do not match IAB standard ad sizes. Now with Custom Size controls on DoubleClick Ad Exchange publishers can easily create and sell ads of any size programmatically. For example, in Northern Europe where the 800x250 ad size is popular, publishers can now benefit from the programmatic demand of Ad Exchange with all the controls and reporting they’re familiar with. In addition to making it easier to implement Custom Sizes, we’re making it possible to increase the demand available to every ad with Flexible Size controls. Publishers can now allow any ad slot to accept bids from multiple ad creative sizes. For example, a custom size slot like 320x300 can now be filled with popular sizes like 300x250 and 250x250 in addition to exact 320x300 matches. Flexible Ad Sizes is now live on all ad slots for publishers globally and publishers can control the range of sizes their slots accept with the Flexible Size rule type. With Custom and Flexible Ad Size controls publishers globally can sell ads of any size and maximize yield for them with programmatic demand. During testing, we observed a revenue increase across all Ad Exchange inventory with some publishers seeing CPM gains as high as 30% for affected ad slots. "Custom Ad Sizes has enabled us to move the bulk of our programmatic deal making to DoubleClick Ad Exchange, which has simplified things a lot. The Finnish market is very much dominated by market-specific ad sizes, especially 980x400 and 300x300." HTML5 is here, are you ready? Since its launch in 2008, HTML5 has quickly gained widespread adoption and is now becoming the standard for developing digital creatives. The advertising industry is responding, and increasing numbers of advertisers and agencies are building HTML5 creatives. If you’re a publisher, this means you’ll want to make your site HTML5-ready and help advertisers get up to speed on developing these new creatives. We know the transition from Flash to HTML5 will require some short-term work on your part, but we’re here to help you and advertisers with the process. HTML5 has seen high adoption rates for a number of reasons. One key to its popularity is that HTML5 offers strong cross-device support—the language works well on a variety of browsers and mobile devices. This is hugely important now that more people are searching on mobile devices than on desktops. HTML5 also plays higher-quality video faster—with an average bandwidth reduction of 35 percent. YouTube notably began defaulting users to its HTML5 player this January. Browsers have taken note of HTML5’s speed and other benefits and have begun introducing power-saving plugins and reducing support for Flash. To increase page-load times, Chrome recently began auto-pausing Flash content that is not a primary part of a page. Safari had already done this and Firefox blocked Flash from auto-loading in July. Update your creative specifications: Explicitly include HTML5 as a supported technology and increase associated file-size limits to support large HTML5 creatives. Educate advertisers: Share the benefits of HTML5 and provide HTML5 creative specifications to your advertisers so they can build creatives that work on your site. Train your teams: Educate your team about HTML creative specifications and let them know what to do when they receive HTML5 ads from advertisers. Assist advertisers: Share free HTML5 ad conversion and creation tools with advertisers to ease their transition to HTML5. All of this and is covered in our new guide to help publishers move to HTML5. If you’re looking for more information as you’re transitioning to HTML5, check out the HTML5 resources and HTML5 Toolkit on the Rich Media Gallery. Also, our Doubleclick Rich Media team is kicking off an HTML5 Hangout series, where over five weeks we’ll set aside an hour to explore topics ranging from how to QA HTML5 ads to building dynamic creative (See the complete Hangout schedule). The first hangout is on September 10th (3pm - 4pm EST) and will introduce you to HTML5 development tools and best practices. Register here. We know that change can be hard, so we want to make your move to the future of digital advertising a bit easier. 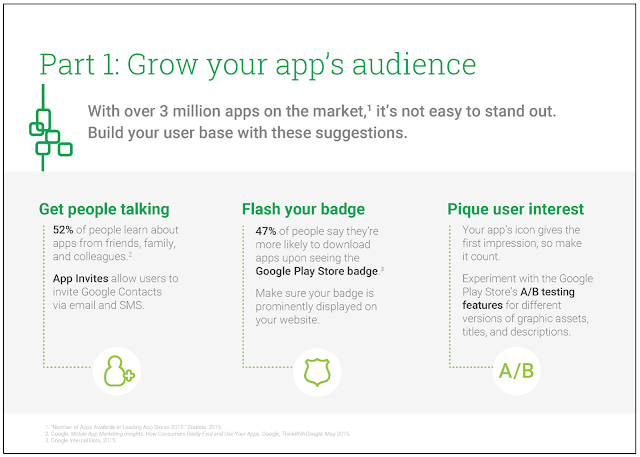 Nearly 60% of smartphone users expect their favorite apps to look visually appealing1. 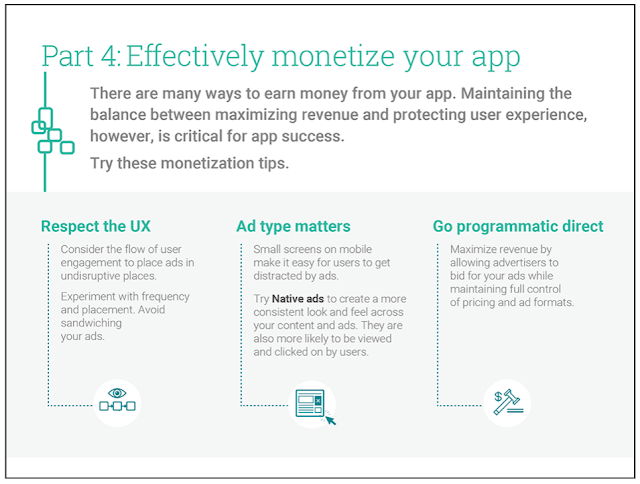 We’ve always believed that in-app ads can enhance an app’s overall experience by being well designed. So today we’re announcing a completely new look for our interstitial in-app ad formats - also known as full-screen ads - that run on apps in the AdMob network and DoubleClick Ad Exchange. The previous design for our app install ads on the left, and our new version on the right. As a brand trying to reach consumers in today’s increasingly fragmented media landscape, it is critical that you understand the impact of your ads on brand metrics such as awareness and consideration. Viewability is the starting point, an initial understanding of whether the ad had a chance to be seen. We have talked before about why measuring the viewability of advertising matters. In December 2014, we shared insights on the state of display ad viewability across the web. As a continuation of that effort, in May we released new insights from our video ad platforms, including YouTube, to start the discussion about the state of video ad viewability. We wanted to take this research a step further, by analyzing the relationship between viewability and brand metrics. To do so, we took our Brand Lift solution, which gives you insights into what impact your ads have on the consumer journey - from awareness, to ad recall, to brand interest - and tied the data to viewability metrics from our Active View technology for a set of YouTube TrueView ads. By connecting these two solutions, we were able to draw out some insights about the relationship between viewability and brand metrics. 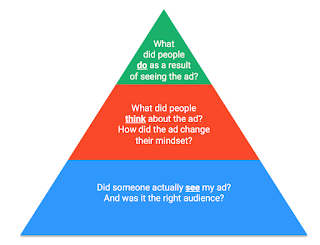 When it comes to brand metrics, ad recall is a foundation for measuring the impact of your ad. As a brand advertiser, knowing if your ad breaks through with users is a key first step to understanding the overall impact of an ad on a suite of brand metrics. In this analysis, we were able to analyze how being able to hear and see your ad affected a user’s ability to recall your ad. Our data shows that users exposed to even one aspect of your video ad (audio or video only), exhibit significant lift in ad recall. However, the full immersive experience of sight, sound and motion delivers more ad recall than either audio or video alone. In fact, the impact on ad recall was 23% higher when users were exposed to ads with audio and video together versus ads with just audio alone. Time in view also plays a large role when it comes to moving the needle on brand awareness and consideration. We recently introduced the ability for Active View users to measure average viewable time - the average time, in seconds, a given ad appeared on screen - in Doubleclick Bid Manager. By connecting these measurements, we can see the relationship between viewable time and brand metrics. Are users viewing your creative for longer periods of time? Brand metrics continue to get higher the longer a user views your ad. Are you buying the right media to have an impact on brand metrics? YouTube’s opt-in TrueView ads are uniquely suited to deliver long-form video content at scale for brand advertisers. Finally, are you thinking beyond viewability to capture effectiveness metrics? You want your ads to move consumers at the moments that matter, and measuring the impact on brand metrics will make for more effective ad spend. This is just the beginning of understanding what impacts brand metrics for video ads. As brands look to measure the effectiveness of their digital video advertising, a continued understanding of what factors drive brand metrics will be crucial to more effective brand spend. Read further research on the impact of online video. To read all of our research on viewability, check out thinkwithgoogle.com/viewability. To see how viewability is measured, visit our interactive Active View demo. As more brand dollars move to digital, and the technology supporting digital advertising evolves, publishers have a tremendous opportunity to boost their revenues and profits. However, capitalizing on this opportunity requires publishers to evolve their sales strategies, fast. As programmatic buying continues to grow, one of the first steps publishers must take is to adopt a holistic cross-channel ad sales strategy. A new op-ed by Paul Zwillenberg, Global Leader of The Boston Consulting Group’s Media Sector, explores this idea and shares the strategies and tactics employed by today’s most successful digital publishers. Head on over to DoubleClick.com to read the full article. Today the Trustworthy Accountability Group (TAG) announced a new pilot blacklist to protect advertisers across the industry. This blacklist comprises data-center IP addresses associated with non-human ad requests. We're happy to support this effort along with other industry leaders—Dstillery, Facebook, MediaMath, Quantcast, Rubicon Project, The Trade Desk, TubeMogul and Yahoo—and contribute our own data-center blacklist. As mentioned to Ad Age and in our recent call to action, we believe that if we work together we can raise the fraud-fighting bar for the whole industry. Data-center traffic is one of many types of non-human or illegitimate ad traffic. The newly shared blacklist identifies web robots or “bots” that are being run in data centers but that avoid detection by the IAB/ABC International Spiders & Bots List. Well-behaved bots announce that they're bots as they surf the web by including a bot identifier in their declared User-Agent strings. The bots filtered by this new blacklist are different. They masquerade as human visitors by using User-Agent strings that are indistinguishable from those of typical web browsers. In this post, we take a closer look at a few examples of data-center traffic to show why it’s so important to filter this traffic across the industry. When observing the traffic generated by the IP addresses in the newly shared blacklist, we found significantly distorted click metrics. In May of 2015 on DoubleClick Campaign Manager alone, we found the blacklist filtered 8.9% of all clicks. Without filtering these clicks from campaign metrics, advertiser click-through rates would have been incorrect and for some advertisers this error would have been very large. Below is a plot that shows how much click-through rates in May would have been inflated across the most impacted of DoubleClick Campaign Manager’s larger advertisers. hidden ad slots -- meaning that not only was the traffic fake, but the ads couldn’t have been seen even if they had been legitimate human visitors. http://vedgre.com/7/gg.html is illustrative of these nine webpages with hidden ad slots. The webpage has no visible content other than a single 300×250px ad. This visible ad is actually in a 300×250px iframe that includes two ads, the second of which is hidden. Additionally, there are also twenty-seven 0×0px hidden iframes on this page with each hidden iframe including two ad slots. In total there are fifty-five hidden ads on this page and one visible ad. Finally, the ads served on http://vedgre.com/7/gg.html appear to advertisers as though they have been served on legitimate websites like indiatimes.com, scotsman.com, autotrader.co.uk, allrecipes.com, dictionary.com and nypost.com, because the tags used on http://vedgre.com/7/gg.html to request the ad creatives have been deliberately spoofed. Unlike the traffic described above, there is also automated data-center traffic that impacts advertising campaigns but that hasn’t been generated for malicious purposes. An interesting example of this is an advertising competitive intelligence company that is generating a large volume of undeclared non-human traffic. This company uses bots to scrape the web to find out which ad creatives are being served on which websites and at what scale. The company’s scrapers also click ad creatives to analyze the landing page destinations. To provide its clients with the most accurate possible intelligence, this company’s scrapers operate at extraordinary scale and they also do so without including bot identifiers in their User-Agent strings. While the aim of this company is not to cause advertisers to pay for fake traffic, the company’s scrapers do waste advertiser spend. They not only generate non-human impressions; they also distort the metrics that advertisers use to evaluate campaign performance—in particular, click metrics. Looking at the data across DoubleClick Campaign Manager this company’s scrapers were responsible for 65% of the automated data-center clicks recorded in the month of May. Google has always invested to prevent this and other types of invalid traffic from entering our ad platforms. By contributing our data-center blacklist to TAG, we hope to help others in the industry protect themselves. We’re excited by the collaborative spirit we’ve seen working with other industry leaders on this initiative. This is an important, early step toward tackling fraudulent and illegitimate inventory across the industry and we look forward to sharing more in the future. By pooling our collective efforts and working with industry bodies, we can create strong defenses against those looking to take advantage of our ecosystem. We look forward to working with the TAG Anti-fraud working group to turn this pilot program into an industry-wide tool. Publishers’ growth in programmatic revenue is outpacing traditional direct sales for desktop and mobile across display and video advertising. New technologies like “programmatic guaranteed” are further blurring the lines between direct and programmatic channels. A new study by The Boston Consulting Group, commissioned by Google, found that despite this trend, many publishers are failing to appropriately capitalize on the programmatic opportunity. For example, the study found that less than 25 percent of programmatic team time is spent on value-creating activities, causing publishers to miss out on significant revenues. The study also closely analyzed the operations of those publishers that consistently outperform their peers in terms of value creation and efficiency, and arrived at best practices and approaches other publishers can follow to achieve similar success. Using simpler ad tech stack configurations, best in class publishers were on average 30% more efficient, had up to 24% higher CPMs, and delivered 10% more impressions otherwise lost to discrepancies. Head over to DoubleClick.com to read the full study. At the DoubleClick Leadership Summit, we discussed the implications for brands, broadcasters and publishers of the shift from Primetime to All-the-time. Read the article on the new DoubleClick.com to learn what each of these mean for advertisers, broadcasters and publishers? Imagine an ad that pops up in the middle of your game; it would be incredibly disruptive. But, one that appears between levels would feel more natural. Or, an ad that blocks your feed as you scroll through; that would be annoying. But, one that’s stitched within the feed would be almost expected. What’s necessary in today’s environment is native advertising—advertising that’s clearly marked and complements the user experience. Native ads for apps in DFP provides publishers with the full flexibility needed to create seamless ad experiences for their users. Instead of serving a static banner ad, DFP delivers ad components (headline, image, links, etc) to a publisher’s app where they’re rendered into a native ad defined by the developer’s code. By providing the building blocks of an ad, our native solution allows a publisher to create ads that are seamless with content, can take advantage of mobile features like swipe gestures and 3D animation, and can be adjusted to create beautiful ads for any device or screen size. 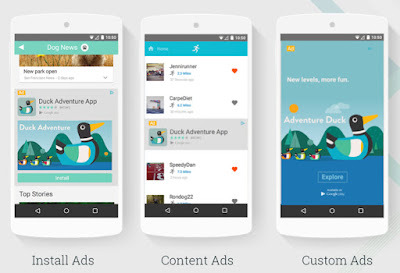 Setting up native ads for apps in DoubleClick for Publishers is easy. Publishers can choose from two of the most popular mobile formats, app install ads or content ads, or create fully custom native ads by including any additional fields for DFP to send to their app. In addition, publishers using our standard native ad formats can maximize revenue by accessing demand from our native ads beta in DoubleClick Ad Exchange. Of course, it’s essential that publishers clearly mark native ads as advertising. Ads that trick users into clicking or are indistinguishable from content are bad for the whole ecosystem, including users, advertisers, and publishers. When users pick up their phones, it’s critical that they’re presented with a seamless ad experience. With native ads in DFP, publishers can maintain a beautiful user experience in their apps while providing brands an opportunity to reach their audience on mobile. Advertisers should reach out to their publisher partners to find out how they can use native ads to connect with their customers and reach them when they’re most receptive. To learn more about native ads in DoubleClick, check out our help center or, reach out to your account manager today. Also, visit the mobile solutions section of our website to see how DoubleClick can help you engage your audience on every screen. As Neal Mohan announced last week at the DoubleClick Leadership Summit, Marketplace in DoubleClick Ad Exchange is now available to all customers globally, and we’re working to bring Programmatic Guaranteed to more publishers as soon as possible. Today, the biggest brands and agencies are increasingly running premium digital campaigns across apps, videos, and native formats using programmatic technology, and we’re seeing this shift reflected across our platforms. Over the last year, the overall volume of programmatic transactions on our systems has grown 59%, while programmatic direct deals have jumped 2X. Today, eight of our top 25 publishers are selling at least 10% of their ad inventory through direct programmatic deals. The growth of programmatic is just part of the story. Programmatic Direct deals, the channel of choice for many premium publishers, are also driving higher inventory prices. Preferred Deals and Private Auctions are generating CPMs that are double or triple what publishers see in the open auction. We see tremendous value in Programmatic Direct but, finding and connecting with all potential advertisers looking for premium offers is a challenge. That’s why we developed Marketplace, an easy to use interface for Ad Exchange buyers to discover, negotiate, and manage deals with the world’s best apps, sites, and properties. For publishers, Marketplace is where their brand is showcased through a customizable publisher profile, and where their programmatic direct offers are discoverable by programmatic buyers globally. Marketplace in DoubleClick Ad Exchange is just the beginning of how we see Programmatic sales evolving in the future. The programmatic buying trend shows no sign of slowing and, we believe even more premium deals will happen through programmatic channels. That’s why, over the rest of this year we’ll be rolling out a brand new way to transact through DoubleClick: Programmatic Guaranteed. Programmatic Guaranteed allows publishers to offer their reserved, premium inventory via a new programmatic channel in DoubleClick for Publishers, and provide brands an opportunity to buy reservations in a more efficient way. Publishers can lock in revenue, while giving advertisers guaranteed access to premium inventory with programmatic targeting and frequency management. It simplifies the workflow of a guaranteed deal, cutting down the steps it takes to implement, from 40 steps to 4. And the best part, it does this all through our Real-Time Bidding infrastructure. In our pilot testing with DoubleClick Bid Manager, Programmatic Guaranteed deals have been creating tremendous value. We’ve seen CPMs at 15-times open auction prices - on par with upfront or reserved campaigns. But in the future, we see incredible new opportunities for Programmatic Guaranteed. Since our solution utilizes Real-Time Bidding, instead of just automating line item booking in the ad server, we can open up innovative new deal types to give publishers enhanced flexibility that truly blends direct and programmatic capabilities. We’re excited about the future of programmatic buying and selling and the possibilities it will bring for all of our partners. If you’re interested in learning more about Marketplace in DoubleClick Ad Exchange reach out to your account manager today, and stay tuned as we look to expand our pilot of Programmatic Guaranteed to more buyers. This morning, we’re hosting the DoubleClick Leadership Summit in Key Biscayne, Florida. This marks the 15th year that we’ve been bringing together our large advertiser, agency and publisher partners to discuss the future of digital marketing. And we have a lot to discuss. As we convene today, we’re in the midst of one of the largest shifts in consumer behavior ever, thanks to the rise of mobile devices. We no longer “go online” but instead, engage in many small moments throughout the day, reflexively turning to the nearest device to solve an immediate need. In these moments, we expect the right answer and we expect it right away. In these I-want-to-know, I-want-to-go, I-want-to-do, I-want-to-buy moments decisions are made and preferences shaped. Brands that are there and relevant for consumers in these moments that matter win. Today, we’re announcing improvements to our DoubleClick products for advertisers and publishers designed to help them thrive in this moments-driven world. Here is a preview of what we’ll be announcing; you can also join us for the live stream, starting at 9 a.m. ET. View the live stream recording here. Today, the decision to make a purchase rarely starts and ends on the same device. For example you may first see an ad for a pair of running shoes while scrolling through the news at work, then actually decide to buy them a few days later when you realize your old ones need replacing. For almost two years, we’ve been investing in solutions that help marketers measure these cross-device conversions in AdWords. And the results have been amazing: marketers are finding that they see up to 16% more conversions from search when they look across devices and take the cross-screen journey into account. Check out our AdWords blog for some in-depth research on that front. Now, cross-device measurement is coming to all of our DoubleClick advertiser products, so marketers can measure conversions that start as a click on one device and end with a conversion on another for all their campaigns across the web, not just with the ads they buy from Google. 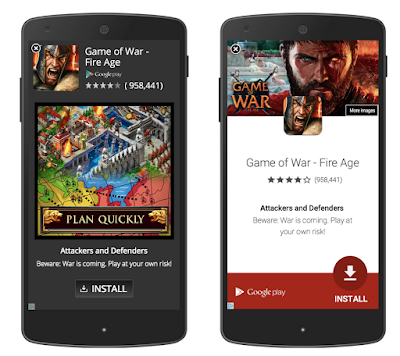 As consumers spend more and more time on their mobile phones, providing ad experiences that respect their context are more important than ever--for example an ad that shows up between levels of a mobile game, rather than disrupting the game itself. Publishers are embracing this change and introducing different types of “native” ad units that are designed to work within their environment, but it’s been a challenge for marketers and publishers to create and deliver these ads at scale. So we’re announcing support for native ads in DoubleClick. 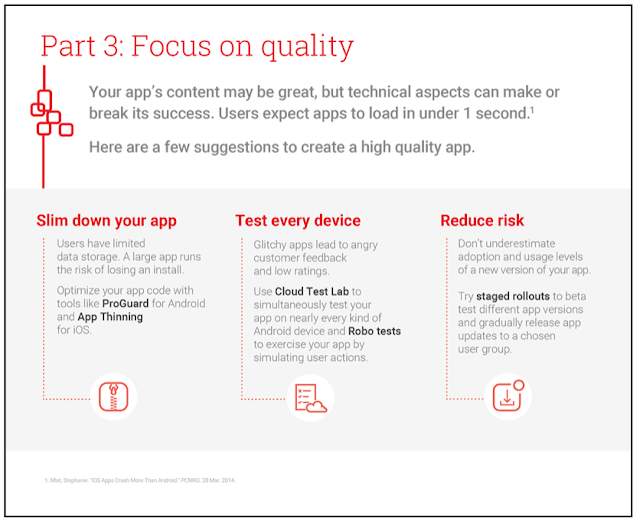 With this new solution, publishers can create their own clearly labeled custom native formats, and decide what ads on their apps should look like. DoubleClick then automatically generates the ads, serves them at scale, and provides metrics to fine tune those native ad campaigns. We will also provide standardized native templates that work across publishers at scale to make native ad buying easy for advertisers. In the early days of programmatic, it was all about direct response advertisers, buying and selling banner ads in an open auction. Today, however, programmatic is relied upon by major brands and premium publishers, across apps, mobile web, video and now native formats. Along with this expansion, we’re seeing that direct deals, those favored by brands and large publishers for premium inventory, are fast on the rise. Just across our own platforms, the volume of programmatic direct transactions has jumped 2x in the past year and eight of our top 25 publishers are now selling at least 10 percent of their impressions via programmatic direct. To reflect this new reality, we’re introducing a new way of buying: Programmatic Guaranteed--guaranteed inventory, sold programmatically at pre-negotiated rates. The early numbers show that this is truly premium inventory, on par with reservations--with CPMs 15x the open market rate. And finally, we’re refreshing the DoubleClick brand (www.doubleclick.com) to better represent our focus on helping marketers and publishers succeed in today’s hyper-connected world. After all, connection is what we’re all about: connecting advertisers and publishers, brands and consumers, messages and moments. We’re excited about the updates announced today and can’t wait to see how marketers and publishers use these new tools to own THEIR moment. Check back next week for our post-DLS blog series where we’ll dive deeper into each of these announcements.